The Disney/Fox deal is finally done and Deadpool star Ryan Reynolds has responded in the perfect way. As of 12:02 E.T. tonight, Disney will officially own most of Fox's media assets. As part of their landmark $71.3 billion deal, they will own all of the movie studio 20th Century Fox, which includes the X-Men and Fantastic Four character rights. Ultimately, that means Deadpool is coming along for the ride. With that in mind, Reynolds had a very appropriate response to the news that the merger is a done deal. Ryan Reynolds has had a good sense of humor about this whole thing ever since the deal was first announced. The Deadpool movies have been R-rated affairs and, historically speaking, Disney doesn't make R-rated movies. However, both CEO Bob Iger and Disney Studios chief Alan Horn have indicated that R-rated movies can exist under the new structure. 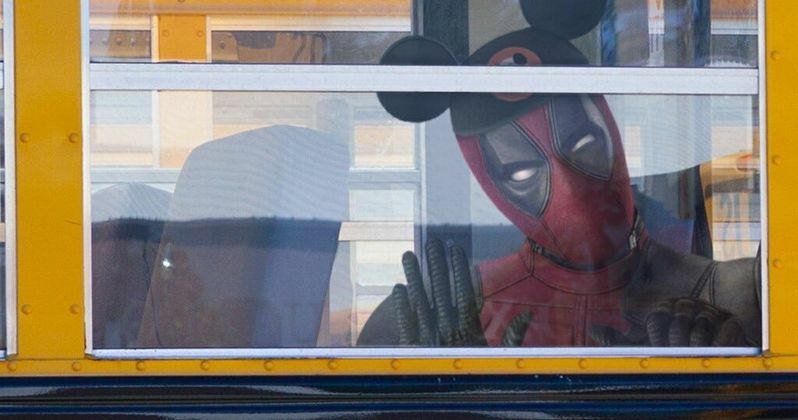 Taking to Twitter, Reynolds shared an image of Deadpool riding a bus with "Disney" plastered on the side. The Merc With a Mouth is sporting a Mickey hat, mouse ears and all. Reynolds captioned the photo with the following. "Feels like the first day of 'Pool." Indeed, even though this franchise may very well get to continue in its R-rated fashion, things are going to change under the Disney regime. So it's the first day of "'Pool" for all of the franchises Disney just inherited. That being said, few of the franchises Disney is now in control of have the kind of box office potential that Deadpool does, which makes this a standout element of the Disney / Fox merger being complete. Deadpool and its sequel, Deadpool 2, along with the PG-13 holiday re-release titled Once Upon a Deadpool, have grossed a combined $1.61 billion at the global box office. Not only that, but these movies have also done very well with fans and critics alike. They have a likable star in the lead role and they lead to lots of merchandising possibilities beyond ticket sales. It's everything Disney wants in a franchise, save for the liberal amounts of cursing and the ultraviolence. It's worth noting that comic legend Rob Liefeld, who created the character, said not long ago that the X-Force movie, which would have brought back Cable and Domino alongside Deadpool, has been scrapped as part of the merger. There are so many questions. Will Deadpool remain its own thing under the Fox banner? Will Kevin Feige and Co. try to fold Wade Wilson into the Marvel Cinematic Universe somehow? What of the main X-Men franchise? Will Ryan Reynolds even be able to appear in the MCU since he technically exists in the current X-Men continuity? We have precious few answers right now. What we know is Disney likes money, and there is still money to be made with this franchise. It's just a matter of how they decided to proceed. Be sure to check out the post from Ryan Reynolds' Twitter account below.